Welcome to the sixth annual Smashwords Survey! Each year for the Smashwords Survey, I analyze ebook sales aggregated across the Smashwords distribution network. We're looking to identify potential data driven insights that can help authors and publishers make their books more accessible, more desirable and more enjoyable to readers. The results are often just as much a surprise to me as they are to you. When I drill down and analyze difference aspects of the data, I don’t know if I’ll find a lump of coal at end of the trail or a pot-of-gold. This year I discovered a lot of gold. As you review the findings, please maintain a healthy dose of skepticism. The data represents the aggregate experience of thousands of authors and millions of dollars in book sales, but your results may vary. Your book is unique. The factors that cause a reader to discover, sample, purchase or enjoy a book cannot be fully explained by data. Nor can data yet determine why one story or writing style is preferable to another. For example, if you were to ask a reader why they purchased a given book, you might receive an answer like, “it looked interesting to me.” But why did it look interesting? In all likelihood, not even the reader fully understands the conscious and unconscious factors that caused them to click on one book instead of another. Was it the color combination on the cover image, the price, the author name, the position of the sun, the day of the week, what they ate or was it a convoluted mysterious witch's brew of thousands of simultaneous factors? I suspect the latter. It’s also quite possible you glean insights from the data that I and others will miss completely. If so, that's great. My goal here, as it is with everything we do at Smashwords, is to create tools and share data that give you competitive advantage in the marketplace. It up to you to put the tools and knowledge to work. 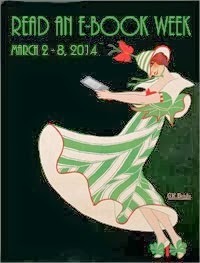 I first presented the Survey results last month at the RT Booklovers Convention in Atlanta, GA. Below I have embedded an enhanced Slideshare Edition of the presentation which contains additional information that was conveyed verbally in the live presentation. Each year I mix things up by examining new aspects of the data. This year, in an industry-first, I share data on ebook preorder adoption rates among authors across different genres and categories. And then I go a step further by exploring the percentage of that genre's sales for the Survey period that were accountable to the books released as preorders in that genre or category. My mind was blown. It was as if bright light suddenly illuminated a dark corner of the universe. On the pricing front, I found signs that many indies who are selling well at $2.99 should probably experiment with higher prices. In previous Surveys, $2.99 and $3.99 were the sweets spots. It looks like it's time to add $4.99 to that mix. There's much more I want to share with you. And here you go, the Smashwords Survey! 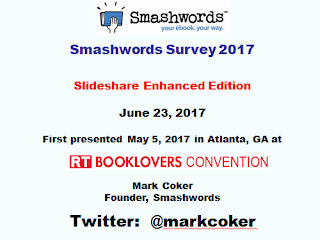 2017 Smashwords Survey of Ebook Trends and Data from Mark Coker of Smashwords, Inc. Sharing is caring! Above in the presentation pane you see this share link. 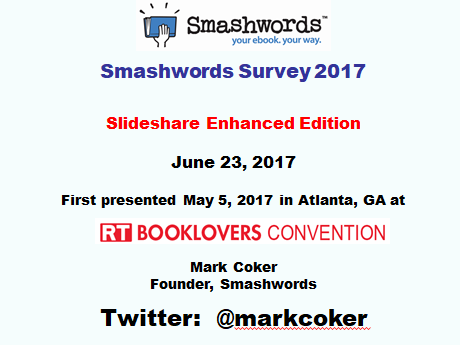 If you find the Smashwords Survey useful, please click it to share it with your friends on Facebook and Twitter, or embed the full presentation on your blog using Slideshare's neat embed feature. The sales data is aggregated from across the Smashwords distribution network of major retailer and library ebook providers for the period between March 2016 and February 2017, the same period as the 2016 Survey. Smashwords distributes to multiple retailers and libraries. The largest Smashwords retailer is iBooks, followed by Barnes & Noble, Kobo, the Smashwords Store, Scribd, Amazon and several smaller outlets including public library aggregators such as OverDrive. Since we only distribute a small fraction of our titles to Amazon, the results may not fully reflect how books behave at Amazon. Use your own judgement. If you distribute with Smashwords, thank you! You are directly contributing not only to our data, but also to our ability to continue bringing you this data. If you don't use Smashwords for ebook distribution, please consider consolidating your distribution with us. We want your sales data, and we want to help you sell more books! 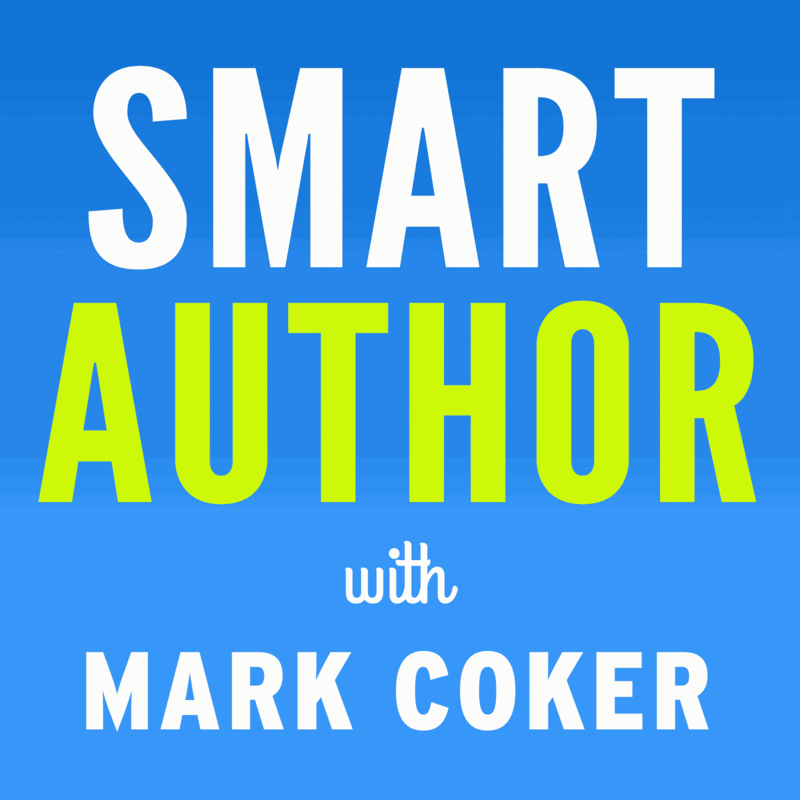 Click to learn how to publish with Smashwords and join over 130,000 authors and small publishers around the world who collectively publish over 450,000 titles with us.